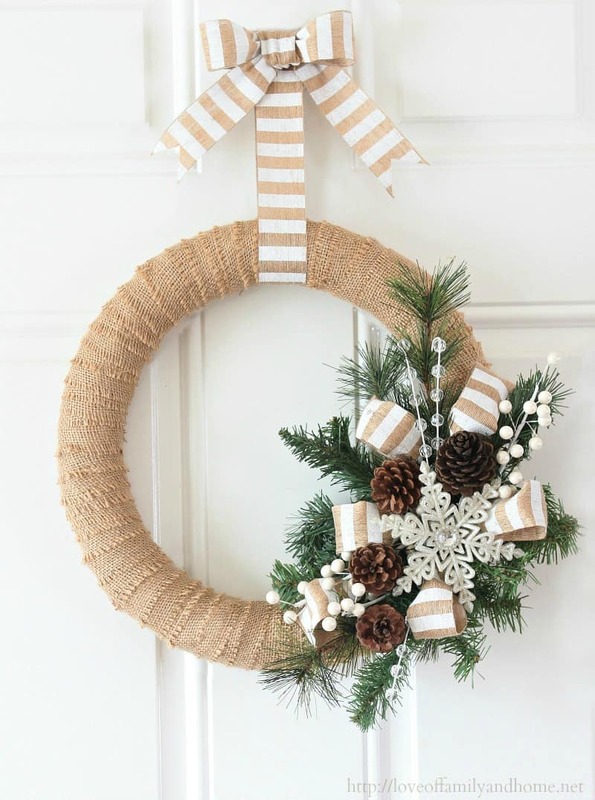 Learn how to make a stunning burlap Christmas wreath. It’s super simple to make and will add some festive flair to your home decor this Holiday season! I know many of you love the Holidays so much the whole house is decorated the day after Thanksgiving, but for some of us we’re still crafting right through December! And since many of our readers can’t get enough of our collection of burlap wreaths we decided it was time to share another one with you. This burlap Christmas wreath was designed by Tonya over at Love of Family and Home and it’s just STUNNING! I love anything that has pinecones in at this time of year. And the sprigs of greenery and berries also give it a festive feel. Such a clever idea too to have the co-ordinating ribbon for the bow and to hang the wreath. This is the perfect project for the coming weekend and is so simple to make, yet looks like you went out and bought an expensive wreath from the store! You could hang it on your front door to welcome your guests, or maybe over the mantel as part of your holiday decor.